Strawberry cream cake made low carb with a simple vanilla cake as the base and homemade whipped cream to top it off! 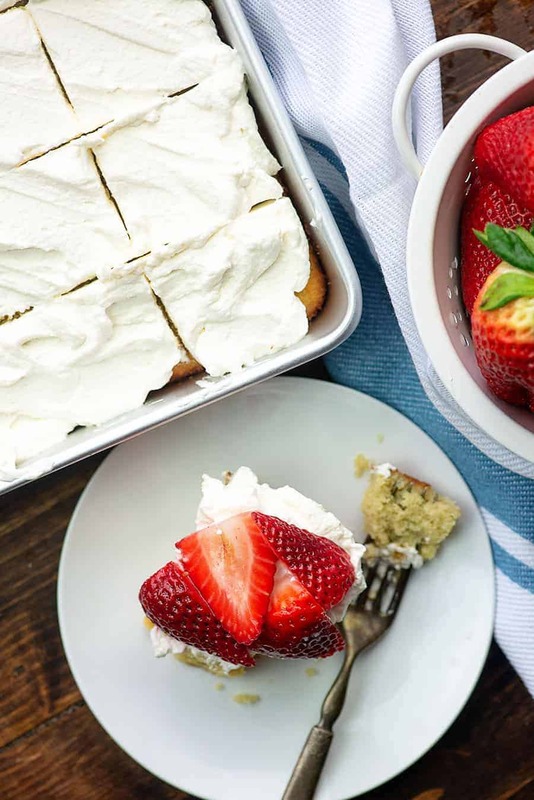 Layer on the strawberries and this dessert is perfect for spring! Isn’t this just the best time of year? The weather is changing from cold to warm and the markets are beginning to get fruit and berries that taste extra sweet and juicy. We love when berries start coming in to season and I can never resist munching on a few strawberries every day this time of year. Strawberries are a favorite of mine and they’re fairly low in carbs if you’re conscious of your portion size! I can make room in my diet for strawberries pretty much ever day, especially when they’re extra delicious and juicy like they are in the spring and early summer. I whipped up a simple low carb cake and topped it off with fresh whipped cream and sliced berries. 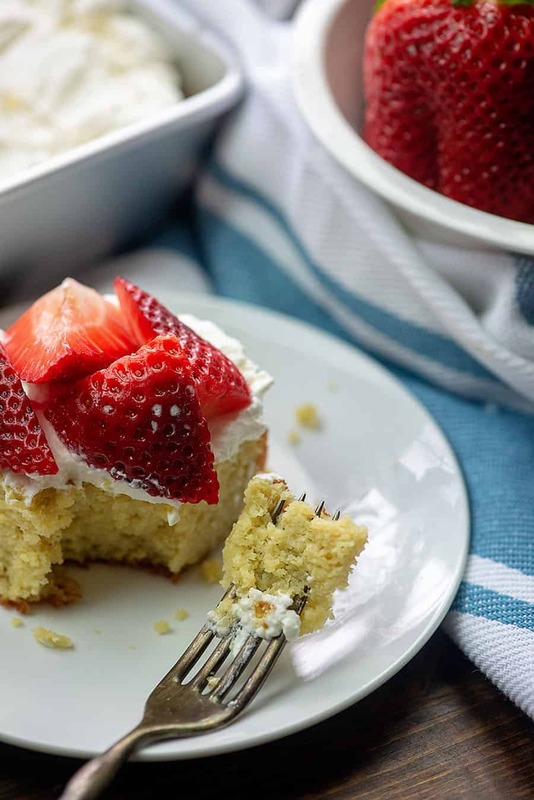 This strawberry cream cake is total perfection! Look how moist this cake is! For the cake base, we’ll start with melted butter, heavy cream, eggs, and vanilla. Whip all of those together well and then start adding in your dry ingredients. This recipe uses coconut flour, but I don’t find it has a coconut flavor at all. 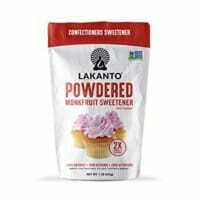 I’ve made this recipe with both xylitol and erythritol as the sweetener. You may use either but I prefer the xylitol. Just be careful as it’s very toxic for dogs and even a small amount can be lethal. 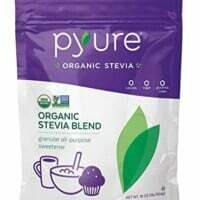 I also add in 1 tablespoon stevia blend. The brand I use is Pyure. It’s sweeter than traditional sugar so you don’t need a lot. You can leave it out if you prefer, but I find that using a mix of sweeteners helps eliminate that ‘fake sugar’ flavor that can happen. You’ll also need a dash of salt and some baking soda. Stir this mixture together and spread it into a well greased 8×8 baking dish. 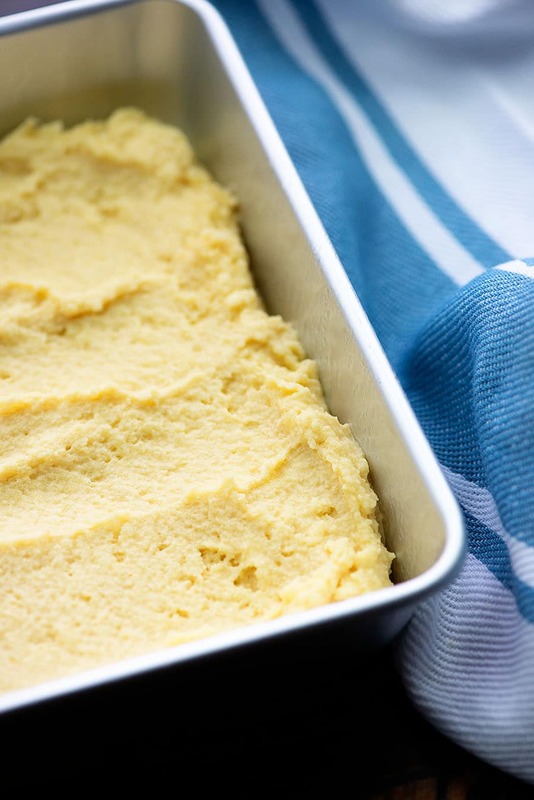 You may notice that this batter starts out with the texture of a normal cake batter, but the longer it sets the thicker it gets. No worries! It’s just the coconut flour doing what coconut flour does – soaking up all that liquid. Bake until the top springs back and a toothpick comes out clean – about 20 minutes. Let the cake cool completely before moving on to the whipped cream. 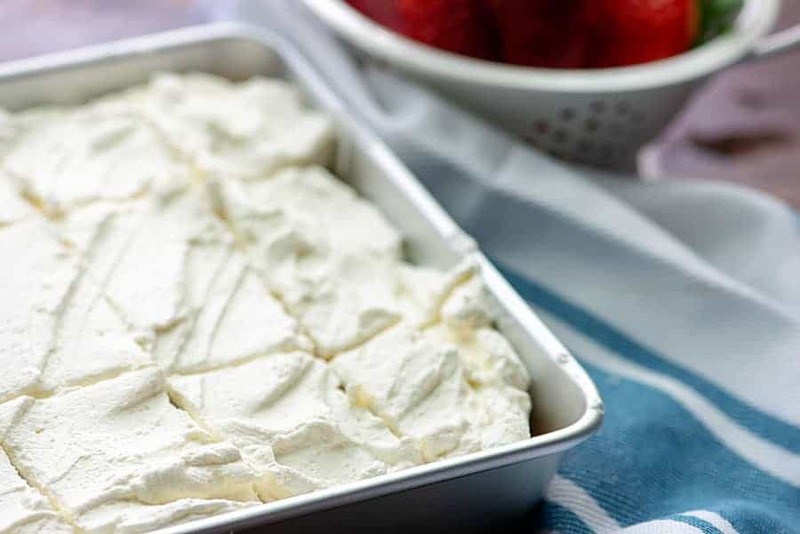 The whipped cream is beyond simple to prepare with just a couple of ingredients. Since it’s acting as the frosting to a cake, I like to lightly sweeten it with powdered sweetener. I used 1 tablespoon of powdered erythritol for this, but whatever brand of sweetener you like should work well here. Just make sure to use powdered or your whipped cream will be a bit grainy. Add in a dash of vanilla and use an electric mixer to whip the cream. Spread it over the cooled cake. Next, you’ll want to slice your berries and give one a taste. If your strawberries are sweet enough, go ahead and use them as is. If you think they could use a little boost, sprinkle your preferred sweetener over the top and stir to combine. I like to layer the strawberries on each individual serving to make cutting and serving the cake easier. It will also keep better if you store the strawberries separately. No Bake Nutella Raspberry Tart: Raspberries and chocolate are the best! Low Carb Lemon Bars: Don’t these look tasty? 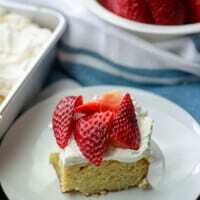 Simple vanilla cake topped off with cream and strawberries! Preheat oven to 350 degrees. Spray an 8x8 square baking dish with non-stick spray. Add the melted butter, heavy cream, eggs, and vanilla to a mixing bowl and mix with an electric mixer until well combined. 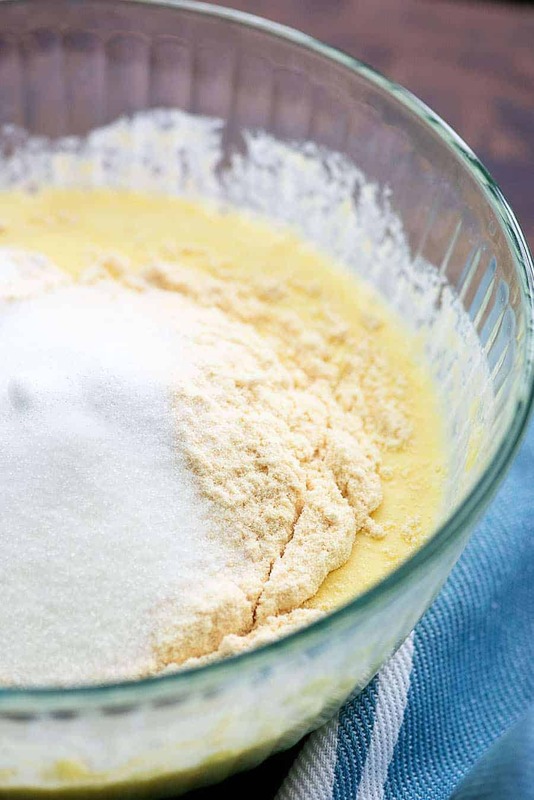 Add the coconut flour, xylitol, stevia, salt, and baking soda to the bowl and stir to combine. Spread the batter into the prepared baking dish and place in the oven. Bake for 15-20 minutes or until the top springs back when lightly touched and a toothpick comes out clean. To make the whipped cream, beat together the cold whipping cream, vanilla, and sweetener until stiff peaks form. Taste the strawberries and sprinkle with sweetener, if needed. Cut the cake into 9 slices and top with strawberries when serving. Store cake, tightly covered, in the fridge for up to 2 days. I've used multiple sweeteners in this recipe as I find it gives the best flavor without an aftertaste. You may use whatever sweeteners you prefer. Nutrition information was calculated with the sugar alcohols already subtracted. I plan to try this cake recipe. As a diabetic I don’t do desserts often. After thirty + years I have grown accustomed to doing without dessert. Rarely do I find a recipe that has a low carb total like this one. Thank you for sharing. Can I make this with almond flour instead? I haven’t tested this with almond flour, but you’d definitely need to make some adjustments. The two flours react differently. LET US KNOW how the trial goes! 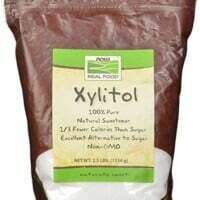 Do I have to use the xylitol? No, as stated in the recipe, you can use whatever you prefer. This looks delicious and so easy to bake! My husband is diabetic and I am always looking for healthy desserts. I have lots of almond flour. Anyone know how much I should use to replace coconut flour? I want to try it. I’m thinking of using some lo carb condensed milk. Punch hold in cake and pour it over cake. 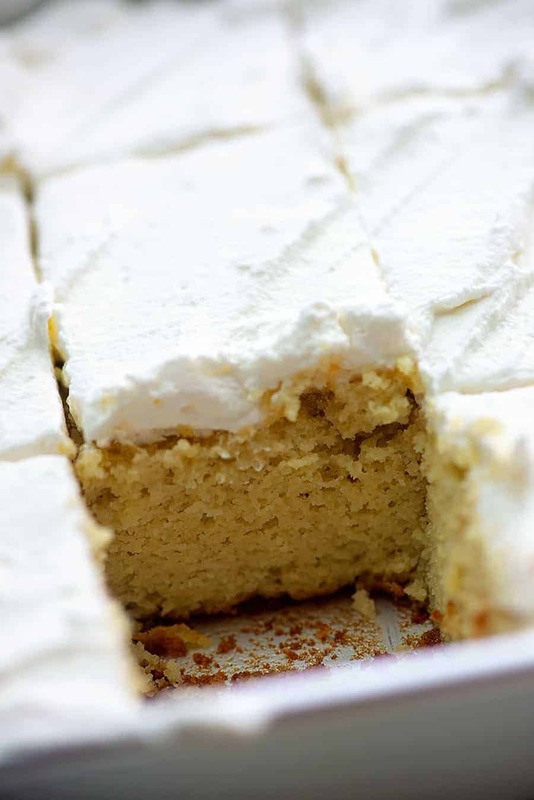 Mix sugar free coconut with whipped topping to top cake. Has anyone tried to double the cake recipe?